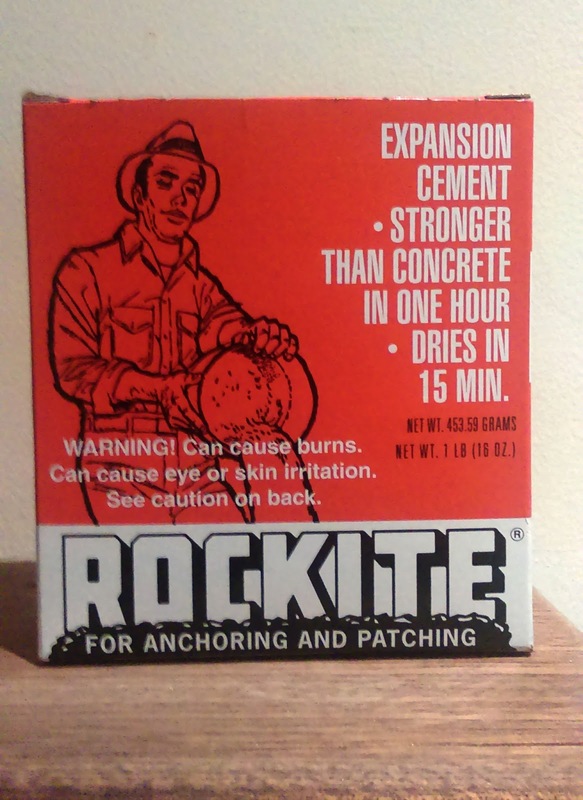 So for the past week I've been waiting for a delivery from the US of a product called Rockite. This is a type of cement mix that I've been hoping to experiment with for the Stephen's Green model base. I've seen it mentioned on Architectural model-making blogs many times so I ordered a small box of the stuff to give it a try. It also happens that I have a few friends with birthdays over the past week (or in the recent few months) so I decided to do a few experiments with the Rockite and make a couple of timely (or long overdue) birthday presents while I was at it. The experiment was to be about moulding and releasing the Rockite and I also wanted to see the sorts of surface finishes I could expect to get with the product. 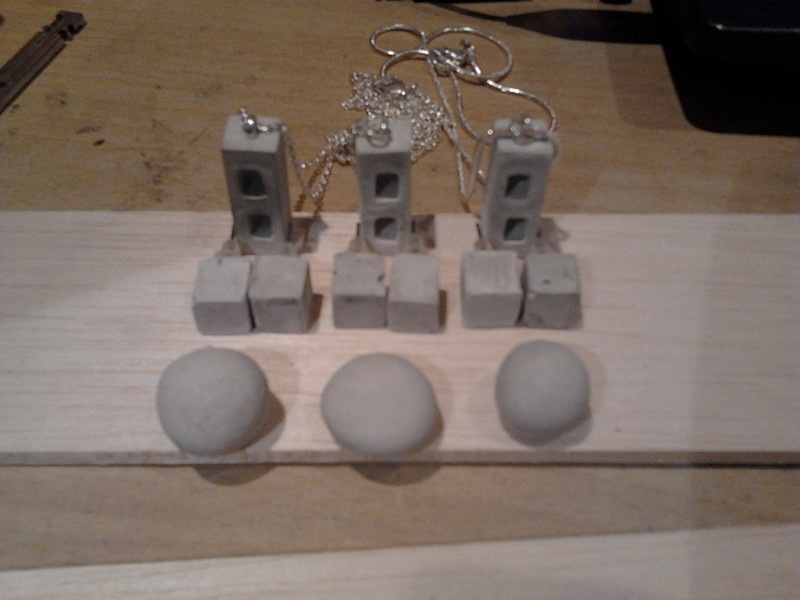 With all this in mind I began to make concrete jewellery. I was mildly tickled by the concept of jewellery made from this product. The idea of tangling associations of delicateness and preciousness of jewellery with the robustness and industrial aesthetic of concrete seemed appropriately playful for the people that would be receiving them, all of whom are involved in architecture or design in some form. 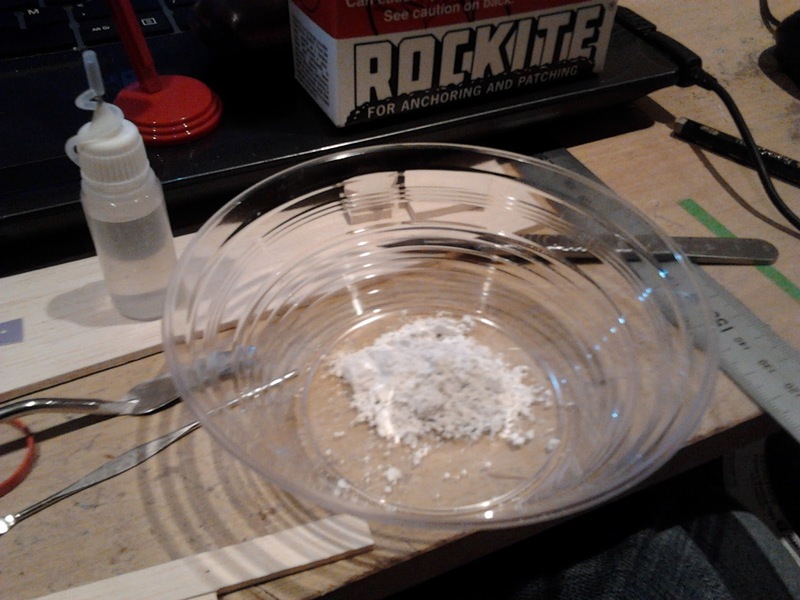 The Rockite was extremely simple to use, just add water, though it warns in the instructions any other additions such as aggregates can mess with the curing I feel I will some day have to play around with this a bit more. 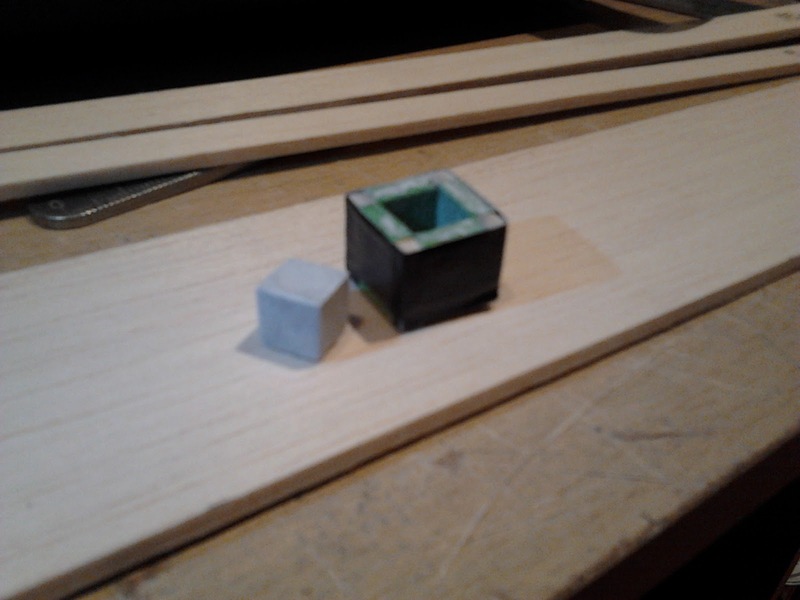 The day before attempting the jewellery I made a mould that could hold a single 9mm square to make a sample piece. 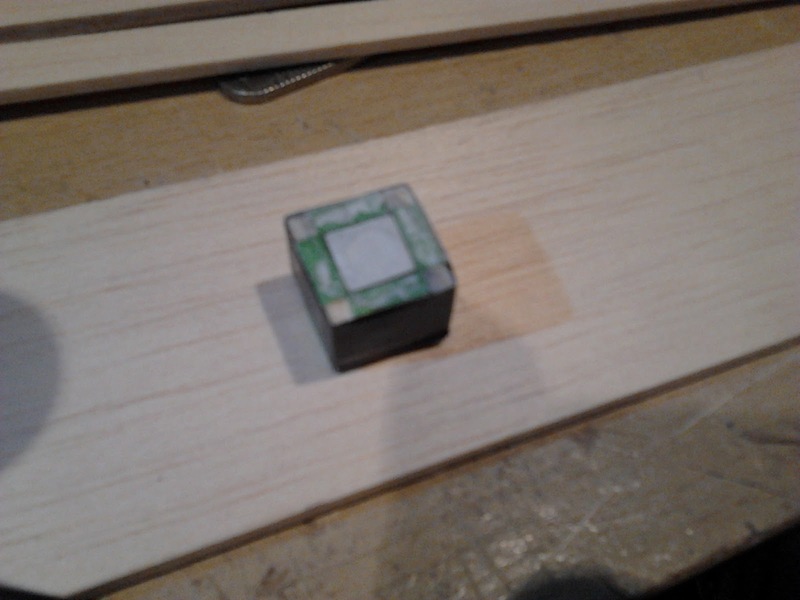 I made the mould out of balsa wood, held together with electrical tape. I didn't want to glue or fix the sides in any other way in case the mould would have to be destroyed to get the piece out. The inside of the mould was coated with a good quality painters tape and was given a light coating with a lubricant to act as a release agent. The test piece came out quite well though there were a few things to take away from this process. The flexibility of the mould due to not being glued or otherwise joined together made releasing the final part extremely easy. The lubrication seemed to work extremely well too with almost nothing, including dust, adhering to the inside of the mould. 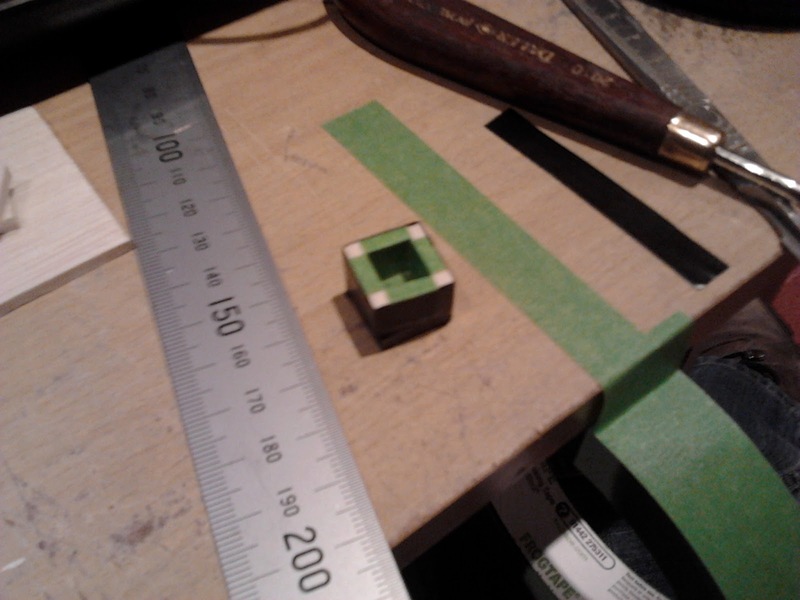 As the Rockite was setting there was a very slight contraction of the material that caused a mild concavity to the top of the square so for the final pieces I should consider a very slight over-fill. Finally the surface of the piece was really nice. Not perfectly clean and uniform as I had expected. After sanding it with 120 and 240 grit paper to sharpen the edges and sealing it with light coconut wax the surface developed a lovely patina very similar to the industrial concrete pieces I intended to replicate. I was also delighted and relieved to feel the weight of the piece was minimal. Particularly significant for the creation of the earrings. On with the show! For the purposes of making the jewellery I popped into town and picked up some necklace and earring fittings. I chose stud earrings with a metal back so the concrete would not sit right up against the soft skin of the ear lobe and pendant necklaces that I felt I could most easily modify with a Dremel to embed in the Rockite. 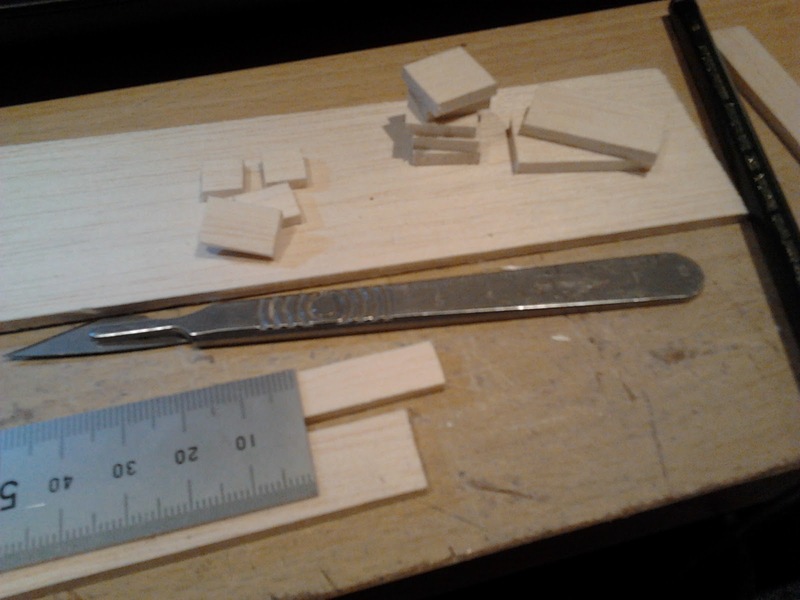 I started by cutting two strips of balsa one 15mm and the other 9mm wide. 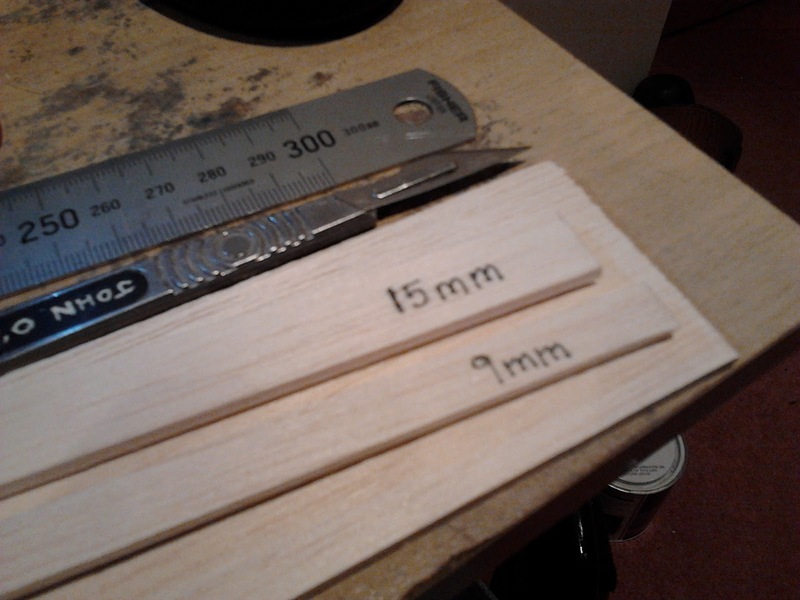 As this wood is 3mm thick these dimensions would allow me to create an open top box with internal dimensions of 9mm x 9mm x 9mm. Next I cut the strips to length to create the bases and sides of the boxes, which would be taped together. The moulds were formed in exactly the same way as the sample box, lined with the painters tape and coated in release agent. I made three of these boxes identical in shape, each of which was intended to be used twice to create six earrings in total. The earrings I bought mostly already had fake gemstones which I removed with a pair of pliers. I mildly splayed the surface left behind and scuffed it with a rough file to ensure adhesion between the Rockite and the metal surface. I mixed enough Rockite to fill these three moulds and used a small needle bottle to add the water to the mix slowly to ensure the right consistency. This was mixed with a palette knife which came in particularly handy when filling the moulds as it is essentially a tiny trowel. I then filled the moulds and added the earring studs. As you can see they were slightly over-filled to account for shrinkage during the curing process which was quite effective. While these three were setting I began making the moulds for the pendant necklaces. These would be a slightly more difficult prospect as the intention was to make them in the form of hollow blocks with two cavities in each. 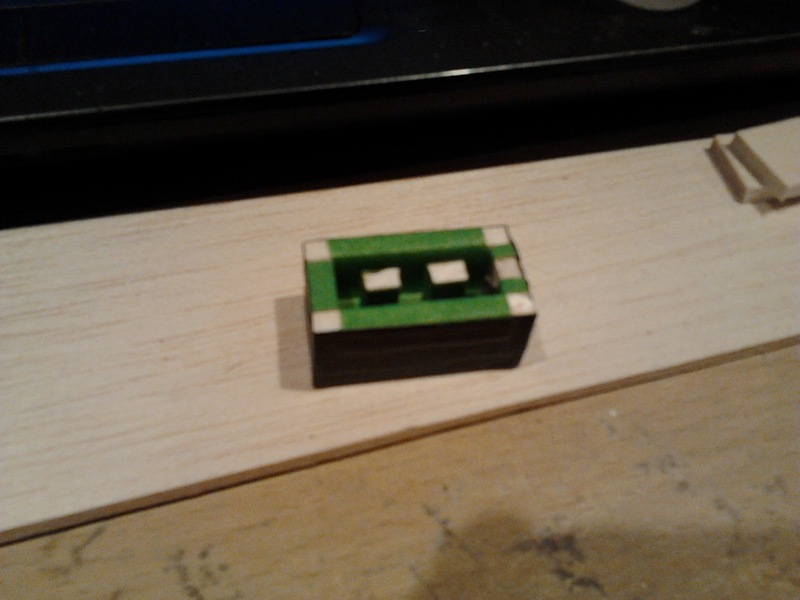 A bit of research got me the standard dimensions of these blocks. While the final product is externally to scale I did decide to make the interior cavities a bit smaller to thicken the walls of the block and make it a bit stronger. Due to the rigidity of the material it may be a bit too brittle if made too thin. 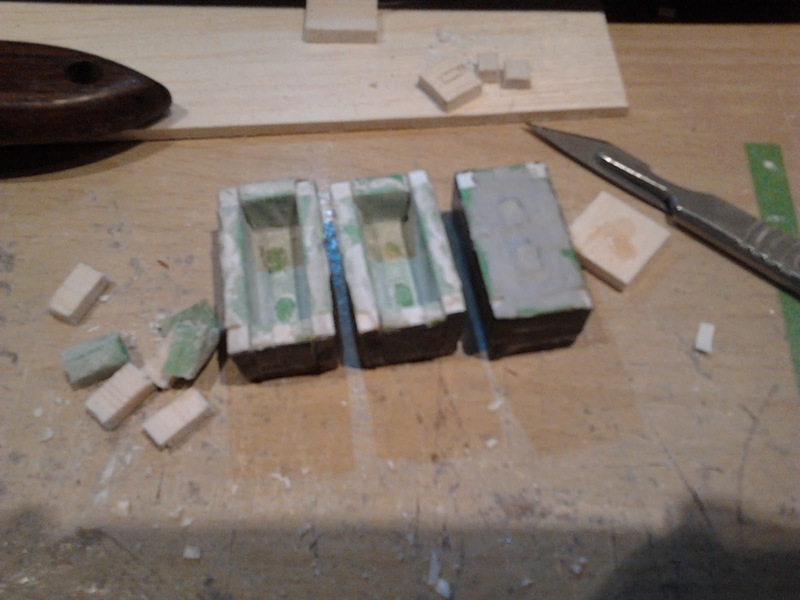 The outside of these moulds was built with exactly the same method as the square moulds. 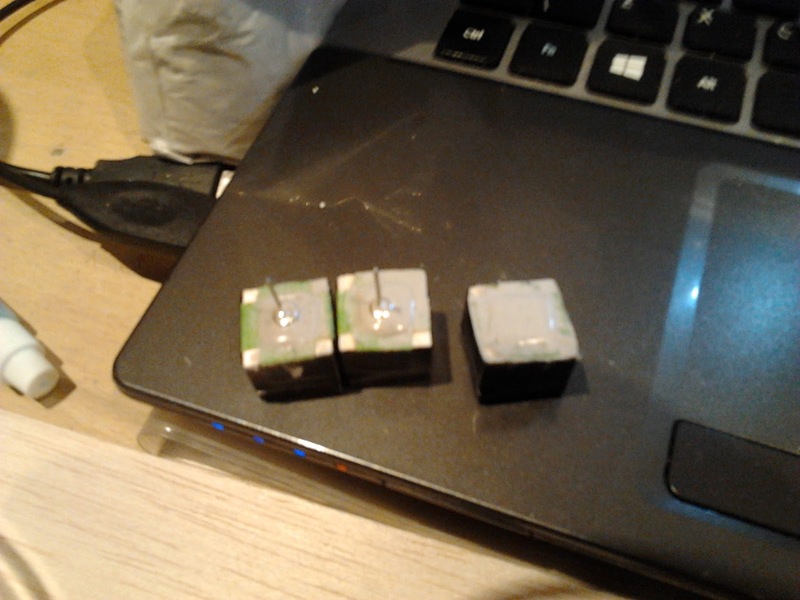 I then cut two small pieces of wood to the size of the cavities and gave them a wrap of the painters tape. These were then affixed in place with all-purpose glue. While this stuff can be a bit messy to work with, due to the fact it's so tacky, I've had good results with it adhering to difficult surfaces. The painters tape was quite slick but the glue adhered admirably and stayed fast in the position they were placed with a set of tweezers. In the photo below you can also just about make out the necklace attachment on the right wall of the mould. This was cut to shape using a Dremel and embedded in a small notch created in the wall to allow the eyelet to protrude from the block. The eyelet was held in place with a very small strip of double sided tape to make sure it wouldn't dislodge during the moulding. Due to the comparatively complex shape of the mould and the fact that the internal posts would almost certainly be dislodged during the removal process I made three of these moulds, one for each necklace. This turned out to be a very good decision as the moulds were torn apart a little more than the earring moulds by the removal of the pieces. In the photo you can see the three moulds one filled and two emptied. The marks from the posts can be clearly seen in the base of the moulds and the discarded posts are on to the left of the moulds. These were fairly simple to remove from the finished pieces with a bit of persuasion from a small pry tool made from modifying a tiny metal spatula I found in a make-up aisle a few years ago when buying nail files for another project. Once all the pieces were finished, I sealed them and attached the chains and earring backs it was long past my bed time and I had to get up early to finish notes for a class I was teaching the next day. Unfortunately this means I didn't get any good shots of the finished pieces except for the one below. As you can see the cavities in the hollow blocks did not turn out perfectly aligned though in person they look quite acceptable. One thing I could do if I decided to make more of these is to cut a hole in the base of the mould and put the posts through the holes to ensure less movement, however I was pleased with the results regardless. While I also thoroughly vibrated and pierced the moulds to avoid air bubbles a few small ones remained on the surface of the pieces. I actually quite liked the effect of these however and the scale of the bubbles matches the scale of pieces nicely to give a more material appropriate effect. In front of each set of earrings and necklace is the remainder of Rockite left after each mixing session. As it turned out they amassed to three almost equal sized pebbles of material. I may use these in models later as rocks or boulders (depending on scale of course). In my rush I had even less time to make nice presentation boxes so in my haste I improvised. Over the last while I've amassed a lot of matchboxes which are occasionally used to build pinhole cameras. With the addition of some black mounting board and a little outside surface obfuscation they made for a presentation as appropriately industrial looking as the contents within. I can report that all three recipients of the concrete jewellery appeared fairly happy with their gifts. I was pretty pleased with them too and I'd be confident and happy to work with this material again.